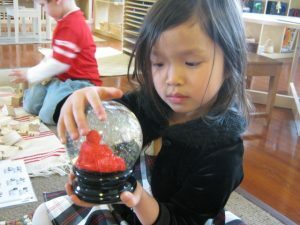 With roots in the child-centered educational philosophy of Montessori, Westboro Montessori School offers a nurturing, holistic educational environment where each child is inspired to become a confident and independent learner. In addition to our main curriculum, Westboro Montessori School offers field trips, special visitor days, and two yearly concerts. Westboro Montessori School’s unique educational approach always maintains low student-teacher ratios. The classrooms are designed to allow teachers to work one-on-one and in small groups with their students. In our multi-age settings, children also have the opportunity to learn from each other. Well equipped classrooms and trained teachers enable children to work at the challenging levels. By working together, parents and teachers can provide the best possible education and environment for Westboro Montessori School students. Therefore, Westboro Montessori School offers educational opportunities and events designed to help parents understand and become a part of their child’s educational process. In addition, parents are encouraged to visit Westboro Montessori School classes and share their special interests and abilities in arts, sciences or cultural traditions. Both inside and outside the classroom, the Westboro Montessori School is always dedicated to the enrichment of a child as a whole.